The Davao City Mayor says he will end contractualization on his first week as president. All five presidential candidates attended the third and final presidential debate on April 24, 2016 at the PHINMA University of Pangasinan in Dagupan City. One of the issues raised was contractualization—something that many Filipinos turn to, just to get employment. Davao Mayor Rodrigo Duterte vowed that he will stop contractualization on his first week as President of the Philippines. 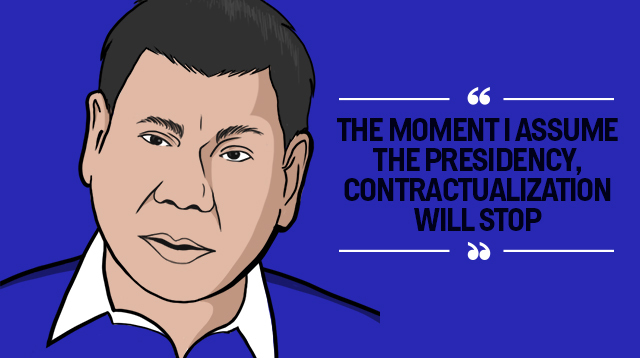 “The moment I assume the presidency, contractualization will stop. They have to stop it. Kasi ganito yan eh, we spend so much money of government and people, ang mga bata, studying sa TESDA. Then they apply and they are accepted as electrician, carpenter. Ang problema ho, after six months because ang mga kumpanya, ayaw magbayad ng mga bonuses and even the 13th month pay, kasi pag dating ng one year niyan, they have to be paid. Yung mga bonus lahat na. So to do away with it, tatanggalin nila before six months." “Yes. I said, 'immediately.' What I will do is I will call the Speaker and the Senate President after their elections and everybody, may constitution na doon, internal. Then I will call all, mostly, the majority, mga Liberal Congressman, you pass this bill immediately. 'Senate,' sabihin ko, 'I need it first week of my administration.' Ganoon lang. Gawin ninyo. That’s the President ordering everybody,” he replied. Did you watch the last leg of the #PilipinasDebates2016 last night? Who are you voting for? Sound off by commenting below!